My relationship with food has been like a roller coaster ride with clowns. Interesting, confusing, and downright scary. Below are some links to posts about eating, working out, and planning meals while staying sane on a Paleo lifestyle. For more information on eating a Paleo diet with running, check out my paleo running post. For cooking and planning meals for Paleo meals, I outlined what I do each week to prep. My final thoughts after completing Whole 30. I grew up eating the SAD-Standard American Diet. We ate what was on sale, what tasted good, and what was easy to cook. I was always on the thin side and didn’t worry about calories or dieting. I was very active in sports and didn’t think much about eating. We used food to celebrate everything from birthdays to typical Friday nights with my grandmother. We didn’t look at food as a crucial component to health. I learned to cook at an early age and I was given free reign to experiment with anything Momma had in the kitchen. I’m so glad I had that opportunity. I think my love for cooking and eating came from a long line of women who showed their love for their family by cooking their favorite meals, making any day a celebration with new recipes, and making sure we sat for a while and laughed about something that might have happened at church that morning. Through many ups and downs over the years, I think I’ve finally arrived at a path I can follow for life. But getting here has truly been a journey. Graduated college, started my first real job, lived in a town with little access to exercise, couldn’t afford a gym, and gained weight for the first time. Got married and got comfortable with more weight. Dropped some weight on a low carb South Beach diet. Moved to Alabama, immediately started running, lost all my weight and was back in my happy weight jeans. Diagnosed with late adult onset Type 1 diabetes while at my healthy weight. Immediately cut every carb known to man and dropped 30 more lbs. Gradually added it back on, started experiencing stomach distress that got worse. When I finally went to a doctor because my own diagnosis of “stress related IBS” was not working, I learned about Celiac Disease. Tests confirmed it. A few months after going gluten-free, I took the plunge and started a strict Paleo plan called Whole 30. Now consider myself 90% paleo. I will eat treats on my birthday, special occasions, and anytime I want to eat treats while knowing the physical results. However, I cannot come in any contact with gluten. It’s a constant struggle to prevent cross-contamination. After seeing some weight loss from eliminating gluten, I did what any person would do. I found gluten-free recipes and cooking methods for my favorite baking, pasta, and bread recipes. It was during the holiday season and I enjoyed my favorite treats! Almost all of them had a ton of sugar. Sugar is my major downfall. I love Cokes, sweet tea (Southern girl, hello? ), ice cream, and any kind of chocolate dessert. But when I looked in the mirror, I couldn’t see my eyes. They were squished between cheeks, eyelids, and forehead fat. Sugar doesn’t contain gluten and I felt I “deserved’ it since I had to refrain from bread and gluten. For some reason, something clicked within me in January 2013. I started the Whole 30 plan. I was given the book, It Starts with Food by the publisher to do a blog review and I jumped in with both feet on a miserable Monday in January. I couldn’t believe the results after just 1 week. I lost 18 lbs and best of all, I could see my eyes again. I was running better, lifting more, and actually waking up with more energy. 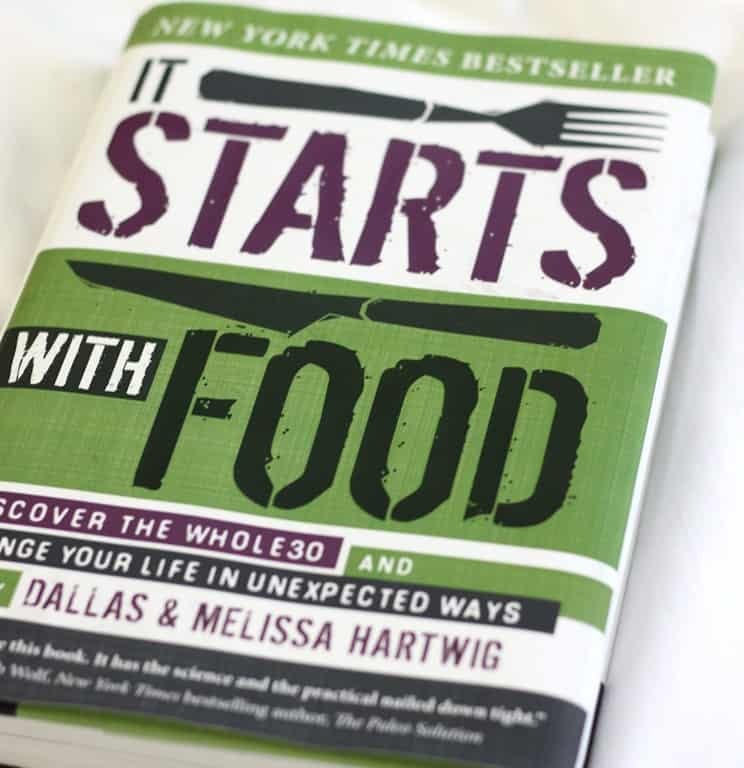 After the Whole 30, the book suggests ways to add back in dairy, legumes, and non-gluten grains a little at a time so you can determine if they cause inflammation in your body and workout routines. It’s not a Whole 365 and they are very clear that realistically, food should be celebrated with traditions, holidays, and random Thursdays. What the authors want you to know is what these potentially harmful foods will do to your body so you have the right information to make food decisions. This plan is how a LOT of people are learning they are gluten intolerant. I already knew that, but I had no idea how much sugar and rice are making me sick.